“I hope he doesn’t! 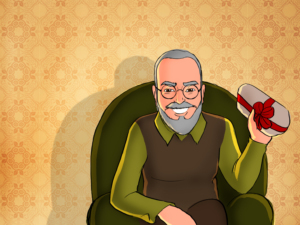 I hope he gives us something prettier than this - something like a magic toy theatre! Imagine it - with the orchestra playing in it and ballerinas dancing across the scene!” replied his sister dreamily. “Poor little thing, how gullible you are! 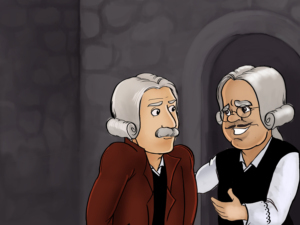 Uncle Drosselmeier doesn’t do magic!” “Or does he?”, Clara persisted. It was not very easy to gather the big family in one room, but soon everyone was at one place before the Christmas tree. 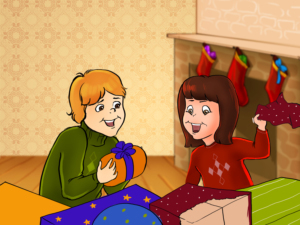 The presents lured the children and the unwrapping began - tin soldiers and dolls were popping out of the boxes. 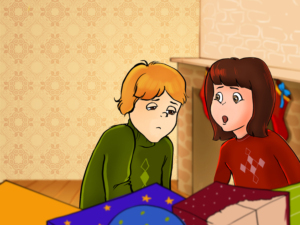 Seeing how small the gift was, Fritz felt disappointed and said, “Let Clara to open it.” His sister was delighted by the opportunity and started examining the package before opening it. “It’s a doll,” she whispered almost to herself and unwrapped it. It was a doll, but not a usual one. 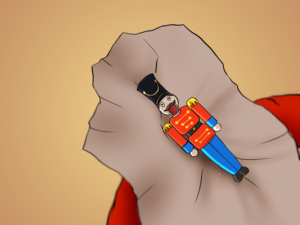 It was a soldier and also a nutcracker - his mouth was wide open so that his big jaws could fit a nut in between. 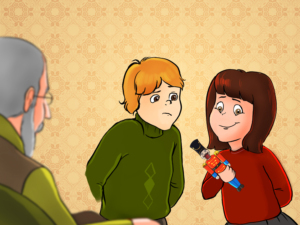 “Honestly, not really a very beautiful toy, but at least the soldier looks funny”, Clara thought and thanked her uncle for it. But Fritz didn’t like the toy at all. “It is so useless, except for when you break nuts.” he mumbled. ...Until it broke! The poor soldier was left with half of his mouth and looked even worse now. “Why did you do it? ” cried Clara, picked up the tin soldier and his jaw carefully and ran and ran to her mother to tell her what had happened. “My baby, I promise you that when I tell uncle Drosselmeier he will make a new nutcracker as good as the old one by tomorrow morning,” said her mother. This didn’t help because Clara really liked this one and now that the soldier was hurt, Clara felt even worse that she should change him for a new one. 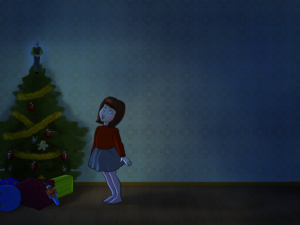 She left it under the Christmas tree but she thought he would feel lonely and so she fell asleep among the presents. At midnight the clock rang and it woke up Clara. It took her a while to understand where she was, when she saw that she was not in bed. She stood up and couldn’t believe her eyes - Uncle Drosselmeier was sitting on the top of the Christmas tree on the place of the angel. 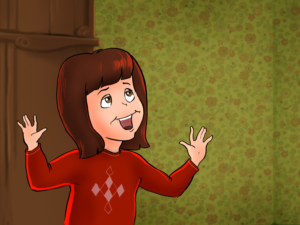 “Uncle Drosselmeier!” shouted Clara, but he didn’t hear her, because he was just a doll. She then looked straight at the Nutcracker. He was lying miserably on the floor, with his part missing. 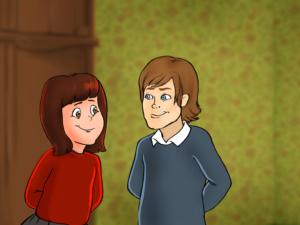 Unexpectedly the doll turned his head and smiled at Clara with his half mouth. “Aaaah!” The girl turned around to run away but she hadn’t made two steps and she saw that the whole floor was covered with mice. The mice were all dresses in uniforms like soldiers and they all had rifles. They were led by a terrible creature with seven heads and each head had a golden crown on it. 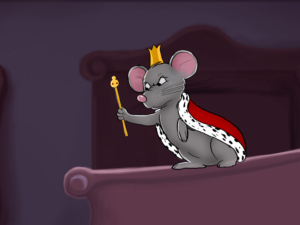 This was the Mouse King. Clara was a brave girl but you should agree that a mouse with seven heads can freak out anyone. 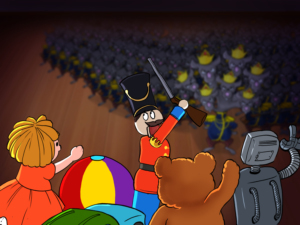 She wanted to run, but when she turned back, she saw that the Nutcracker was leading an army of toys behind him. 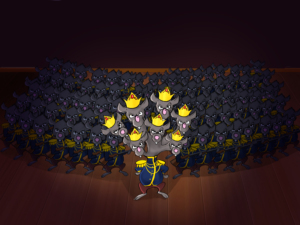 When they were all lined up and ready for a battle, the Mouse king and the Nutcracker gave a signal to their soldiers and the fight started. The clash was great but even more spectacular was the fight between the two leaders. 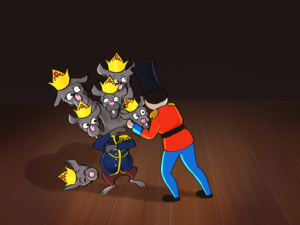 The Nutcracker would have fought over the Mouse King, who was biting the body of the soldier with his seven heads. 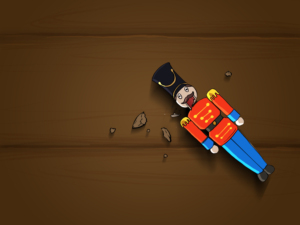 If only the Nutcracker could catch his necks in his jaws, but he could only jump and kick the Mouse King with his legs. 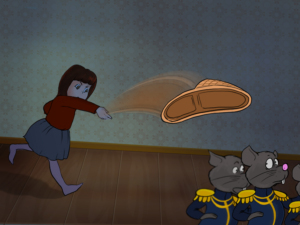 The Mice soldiers surrounded the Nutcracker, took him by the feet and lifted him, but Clara took one of her slippers and threw it after the Mouse King. 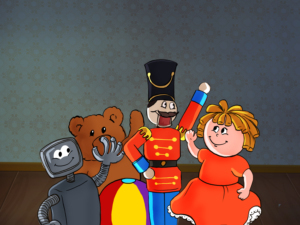 He ran and hid in a wall crack and so did his soldiers, who were scared of the giant doll and her slippers. The toys started cheering and dancing. They celebrated all night and in the morning they all went into the boxes. Clara went to her bed and fell asleep too. In the morning uncle Drosselmeier was already waiting for her in the kitchen with the nutcracker in his hands - he had fixed his jaw and the doll was as good as new. “Thank you so much uncle! He is the best present I have ever had!” and then Clara told him about her dream. “That’s an interesting dream indeed. It reminded me of a story…” he said. 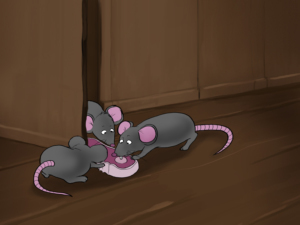 “One Christmas, mice cracked into the palace and ate all the meat, which was meant for the King’s lunch. 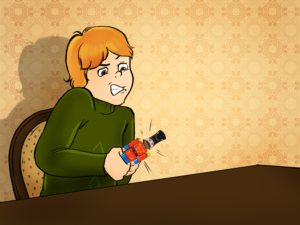 The King ordered his special inventor, whose name was Drosselmeier too, to create mouse traps and to lay them all over the kitchen. Many mice were trapped and their Queen was furious about it. She found the humans’ queen room one evening and climbed up her dresser. “How dare you kill my children?” the mouse yelled. “I will make you pay for what you did by turning your daughter’s beautiful face into something so ugly, you wouldn’t want to look at,” she said and disappeared behind the curtains. When the King heard the threat, he ordered that seven cats should guard the princess's bed at night, so that no mice can approach it. 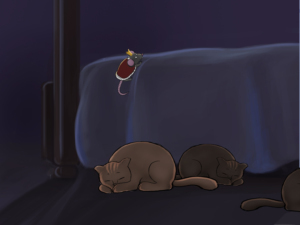 But as the cats fell asleep at night, the Queen mouse crept up the princess’s bed and said her spell. 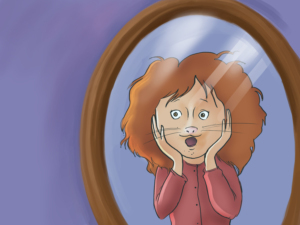 In the morning, when the girl saw herself in the mirror, she screamed in terror. Her nose was just so long and her eyes so small, that she resembled a mouse a little. Her hair was messy and she had dots on her chin. 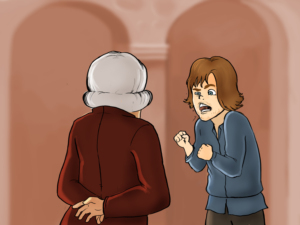 The Queen and the King were furious when they saw what had happened to their child. The King ordered Drosselmeier to invent something to turn the old look of the Princess’s face within four weeks. But the poor inventor wasn’t a magician and he had no idea how to deal with the problem. So he went to ask a friend for an advice. “The princess should eat the hardest nut. But it should be opened for her by a boy who has never shaved with his eyes closed. He should then make seven steps backwards without stumbling. Only then will she be cured.” It was a strange advice that his friend gave him but since he had no other choice, Drosselmeier followed it. He searched the whole Kingdom for the hardest nut. A week had passed when he finally found it he went to the King. “Now we should just find the right boy to do the work,” he said. 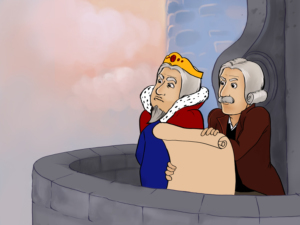 The King announced that the boy, who succeeds to turn back the beautiful face of his daughter, will marry her. And many boys tried but none was as strong as to break the nut with his hands. Until one day, Drosselmeier’s nephew came to visit his uncle. 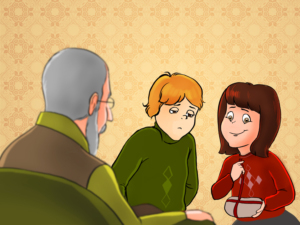 The fourth week was almost at its end and the old man asked his nephew to try his luck too. The boy hadn’t started shaving yet so he was a good candidate. When he was given the nut he put it between his jaws and pressed them until the nut finally cracked. Then he took the seven steps back. But! On the seventh step he stumbled. 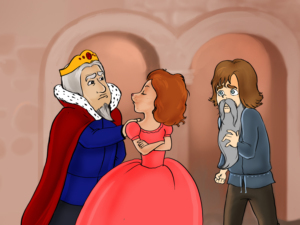 He succeeded to cure the princess but because he stumbled his face turned ugly. His lovely smile turned into a stupid grin and his head grew bigger. 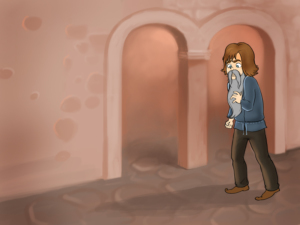 He grew a long grey beard and moustache and he looked not only ugly but stupid too. That night Clara couldn’t fall asleep. Not long after she went to bed, she heard the voice of the Mouse King. 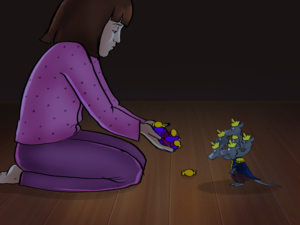 “You will either give me your sweets or I will eat the head of your beloved doll.” Clara immediately took out all the sweets and gave them to the Mouse King. He quickly gobbled them and asked for more. So she went down and took out all the sweets that she could find - but the Mouse King wanted more, so she gave him the Christmas pudding, and a cake and biscuits. 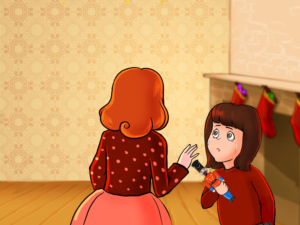 The sweets were running out and Clara had no idea what to do, plus she thought of her mother’s reaction on the next day and she started crying. The Nutcracker heard her cry and ran to find her. When he arrived he wait no more. 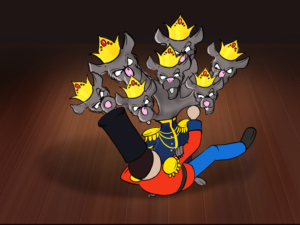 Now that his jaw was fixed, he bit off the Mouse King’s heads one by one. 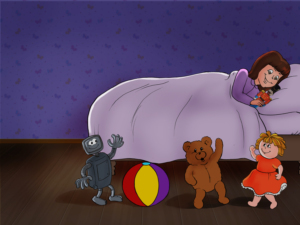 Clara took her hero to bed with her and they watched the most fabulous toy show that one could imagine. Dolls were dancing all over the floor all night long. 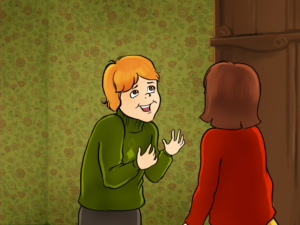 In the morning when Clara woke up, she hurried to tell her mother what had happened the night before. 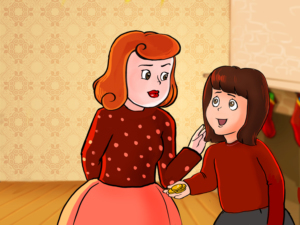 But after she listened to her story about the fight between the Mouse king and the brave little Nutcracker, her mother said “Clara, stop believing in every dream of yours!” But the girl took out of her pocket seven golden crowns to prove that it was not just her imagination. Yet, her mother didn’t believe her. Clara went back to her room crying. 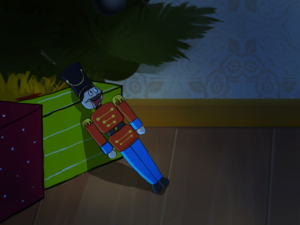 “I will keep the Nutcracker forever and if he was a real boy I would love him for his good heart, no matter how ugly he was.” she said that a tear fell on her bosom. And as she said that, she heard her uncle’s voice. 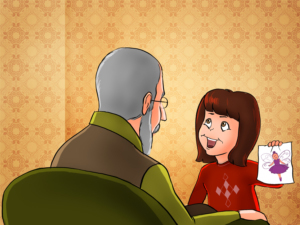 She ran to tell him what she was thinking, but she was surprised to see that uncle Drosselmeier wasn’t alone. His nephew was with him. He was no longer ugly but beautiful and with a lovely smile. When Clara had said she would love the Nutcracker she had broken the spell and now her brave guard was standing right in front of her. When their eyes met they knew that one day they would be married and they would live happily ever after.